A 17-year-old girl had her car stolen at gunpoint yesterday (Tuesday) afternoon in an incident involving a criminal gang believed to be from Dublin. Chloe Hawthorne was alone in the house at Seagahan Road, Markethill, when four men approached the rear of the house. They pointed a suspected handgun through the window at the teenager, who was in the kitchen. After she refused to open the back door, the men smashed the half glass panel of the door and climbed through the opening into the utility room and again pointed the gun at her, demanding her car keys. Said a PSNI spokesman, “She told them the location of the spare set of car keys which they took along with her mobile phone before they made off in her white Ford Fiesta car. The incident was part of a chain of events involving the gang, which began in Dublin yesterday morning when a Vauxhall Insignia car was stolen. The gang are believed to have driven to the Markethill area and broken into a house on the Damoily Road, ransacking it and stealing jewellery, watches and a legally held firearm. Afterwards, their car collided with a Ford car at Redrock corner on the Seagahan Road shortly before 4.40pm. The female driver of the Ford car was treated in hospital for a number of non-life threatening injuries. The gang made off on foot to the nearby Hawthorne’s house, and after stealing the car at gunpoint there, made off back over the border. The incident has been condemned by Newry & Armagh DUP Assemblyman William Irwin MLA. He said, “This is a shocking and appalling criminal act and having spoken to senior police I know that there is a significant operation ongoing in Dublin at the moment to apprehend those behind this attack. “My thoughts are with the individual at this time as she gets over this awful ordeal. It has been such a massive shock for her. “I am aware that both the PSNI and the Garda are co-operating in an ongoing operation on both sides of the border to apprehend those responsible and hopefully those behind this attack can be brought before the courts. 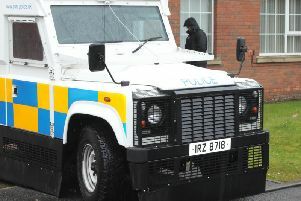 The Vauxhall car, which had been reported stolen in the Republic of Ireland, has been recovered for further examination. Detective Inspector Stephen Harvey is appealing for anyone who witnessed the incidents or anyone with any information that can assist with the investigation to contact detectives in Lurgan by calling 101 quoting reference number 868 or 954 of 11/10/16.